Edan Milton Hughes was born in Maysville, Kentucky in 1935. His youth was spent in the Bluegrass State, some of it on his grandfather’s knee, listening to tales about grizzly bears and other fearsome beasts of the forest as rain pelted the tin roof, precious moments that molded his imagination. Military service interrupted his studies at the University of Kentucky, and in 1956 the U.S. Navy brought him to San Francisco for active duty, where he began a fifty-nine year love affair with the city and culture of northern California. One longtime association that Edan especially treasured was that with iconic rock impresario Bill Graham, who often engaged Edan as an assistant for diverse projects including office décoration and preparation of dressing rooms at the Fillmore Auditorium and Winterland Ballroom. Working around such acts as The Rolling Stones, Creedence Clearwater Revival, The Grateful Dead, and Led Zeppelin during this golden age of rock, Edan rubbed elbows with Mick Jagger, John Fogerty, Carlos Santana, Robert Plant, Jimi Hendrix, Grace Slick, Jerry Garcia, and “Mama” Cass Elliott. He also assisted with staging props at Winterland for the film “The Last Waltz,” the documentary directed by Martin Scorsese that immortalized the farewell performance of the Canadian group The Band. Edan was also active for several years as a real-estate salesman, which ultimately lead to a passion to collect the fine art that had been created in his adopted State. When San Francisco’s Western Addition district was being razed for redevelopment, he made daily trips to the shops up and down McAllister Street where he found, among the contents of these Victorian houses, paintings by the almost forgotten masters of California art, which were being bought and sold often with little interest. Having grown up with a profound respect for old paintings, Edan was shocked at the probable fate of what he realized were museum quality works of art. In the 1950s and 1960s, canvases by such masters as John Marshall Gamble, Granville Redmond, Carl Jonnevold, and many others could be had for very little as unwanted “Victoriana”. This situation presented an opportunity for Edan to build a superb California art collection from paintings that otherwise would have been discarded or destroyed. He also found them at local flea markets, in antique stores, and through his various friends and contacts in the art world. Visitors to his flat near Mission Dolores would observe his walls, covered from floor to ceiling with paintings. As they strolled from room to room, they would find more paintings nestled in their period frames leaning in neat columns against a chair, a fireplace, a bookcase, and every once in a while one could be seen propped up on the edge of the bathtub. As the interest in pioneer California artists grew, Edan easily transitioned into the role of a first class art dealer. With his guidance hundreds of others began to appreciate and collect California art. Today, with Edan’s help these artists and their works have once again found their prominent place in art world. His devotion for these artists work did not stop at collecting or selling. In 1986 he published a monumental reference work entitled “Artists in California, 1786-1940”. When he began compiling data, a number of the artists were almost unknown in the art world. His initial discoveries lead to years of dedicated research that ultimately became a biographical dictionary of the “painters, sculptors, etchers, commercial artists, illustrators, lithographers, engravers, watercolorists, muralists, pastelists and teachers” who made contributions to the rich fabric of early California art. This historical project began as a hobby with scribbled notes and ended up as a comprehensive complication of data from census records, newspaper and magazine articles, gallery notices, obituaries, old catalogues, phone books, city directories and personal interviews with living artists and the descendants of deceased ones. These many sources of information were transformed by Edan into the indispensable two-volume encyclopedia with more than 20,000 entries that is now widely prized by collectors and dealers alike. Initially, Edan published his research book independently. In time, however, the Sacramento’s Crocker Art Museum recognized its unique value and decided to publish the updated third edition in two volumes under the auspices of the museum. This work provides data of the well known artists and it is the only comprehensive source for lesser known ones whose names and work would otherwise have disappeared. Even after this revision, Edan continued to add to his collection of biographies and planned to update “Artists in California” digitally. Edan’s research produced the ultimate reference on the California artists, which he called “my magnificent obsession,” and scholars have lauded it for its accuracy and completeness. Appreciation of early California art has spread from coast to coast with galleries and auction houses now carrying and enthusiastically promoting this regional art. “Anybody at all involved with California art knows Edan’s book,” said Scott A. Shields, chief curator of art for the Crocker Art Museum. “It’s an incredibly useful tool. Almost every day someone calls me with questions. If they’re about art before 1940 I just grab his book off the shelf and he seldom fails me.” Harvey Jones, senior curator at the Oakland Museum agrees. “Nothing like this ever existed before, in contrast to the extensive indices of European art,” he said. 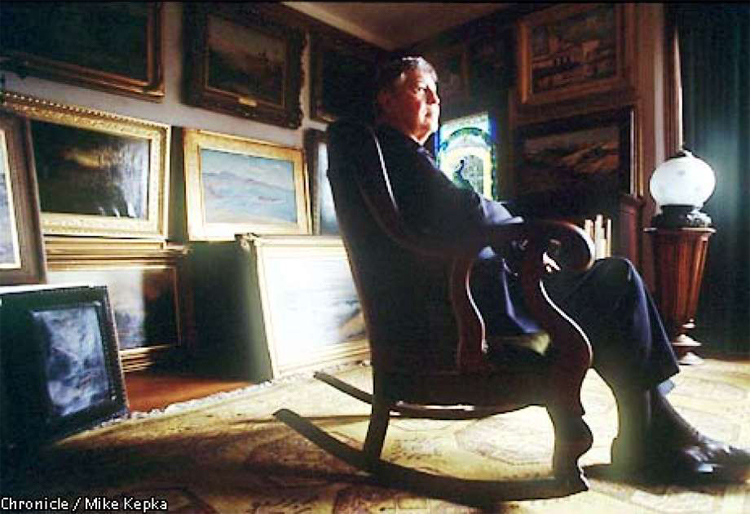 “It’s a wonderful tool for everyone interested in California art.” A few years before his death, Edan donated a significant number of paintings from his collection to the Crocker Museum. Accordingly, one of its exhibit galleries has been dedicated in his name.